My previous post explained how an individual spam retention policy can be created with GFI MailArchiver. A spam retention policy should prevent that GFI MailArchiver archives further spam emails from the journaling mailbox into the active GFI MailArchiver Archive Store. Currently, no emails from the journaling mailbox will be downloaded by GFI MailArchiver. New emails will therefore remain in the journaling mailbox of the Microsoft Exchange Server. In this blog article I will go through the steps required to remove all spam emails from the old GFI MailArchiver Archive Stores. First export all emails from the old GFI MailArchiver Archive Stores and then import all emails again into the new GFI MailArchiver Archive Stores. Our spam retention policy (which we have created in the previous blog article) will then remove automatically all marked spam emails from the new GFI MailArchiver Archive Stores. 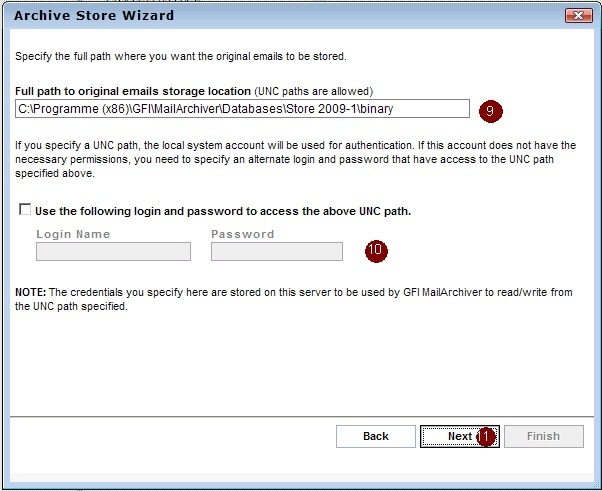 Open the node “GFI MailArchiver” >> “Archiv Stores” in GFI MailArchiver (1). GFI MailArchiver will then list all GFI MailArchiver Archive Stores on the right side. Now I will need to identify if, and which, GFI MailArchiver Archive Stores contain spam emails. In my example I have found spam emails only in one Archive Store which is called “import”. So, I need to create only one new Archiv Stores for GFI MailArchiver in total. Here I will later move all emails (except spam emails) from the old Archive Store. 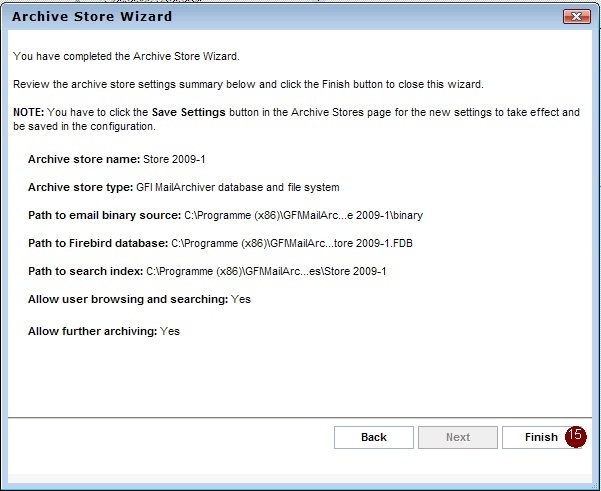 Click on “Add Archive Store” (5) to proceed to the next form. 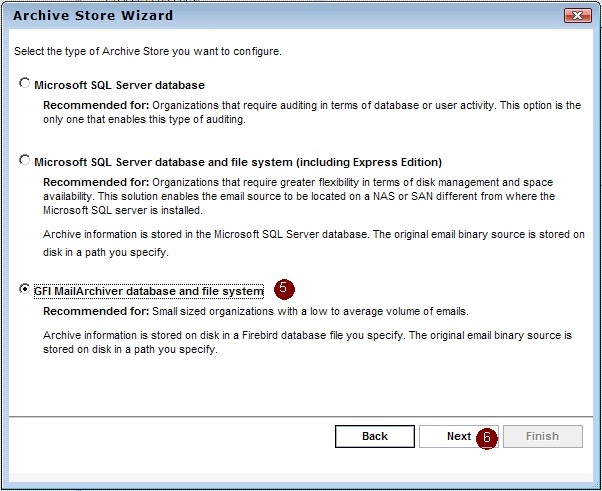 An “Archive Store Wizard” window will pop up. 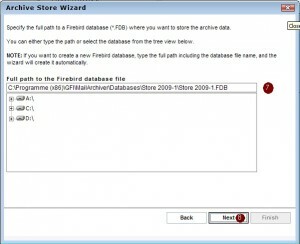 Enter a proper name for the new GFI MailArchiver Archive Store (3). 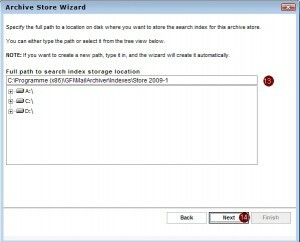 Per default the option “Allow user to browse and search this archive store” will be enabled. Confirm the name of the new Archive Store (“Next”) (4). 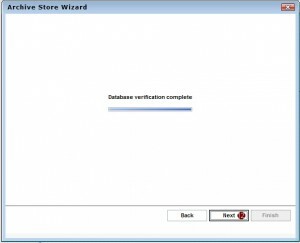 Configure the type of the new Archive Store. 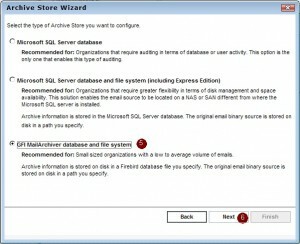 I can choose between a Microsoft SQL database and a GFI MailArchiver database. Select the option “GFI MailArchiver database and file system” (5) and confirm (“Next”) (6). 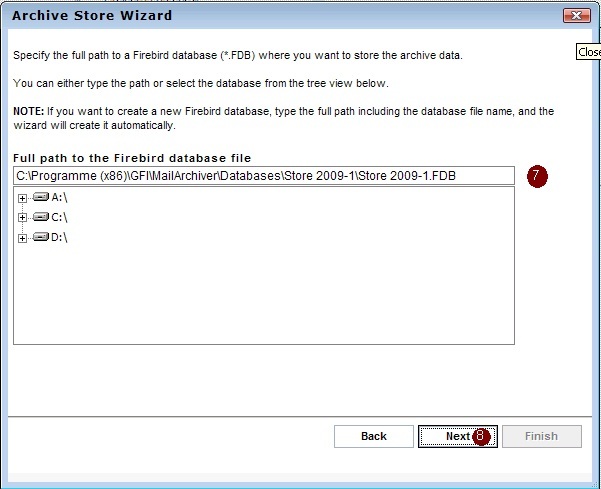 Specify the full path of the Firebird database (7). The text field only allows me to set a local path. Enter and confirm the full path (“Next”) (8). Specify the full path of the binary folder (9). GFI MailArchiver should store the original emails in the specified binary folder. The emails will be encrypted and will be also compressed. Here I am able to set an UNC path (10) instead of a local path. In my example I will decide to store the emails in the local path. GFI MailArchiver will now verify and update the database schema. 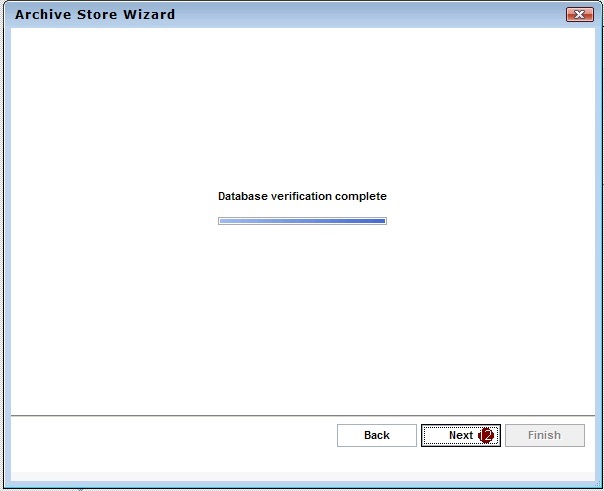 Proceed to the next form after the database schema verification has been completed (12). 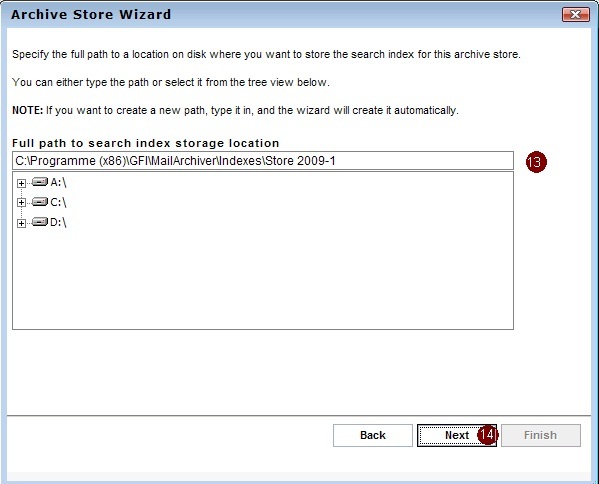 Specify the path for the search index file for the GFI MailArchiver Archive Store (13). Confirm the path (“Next”) (14). 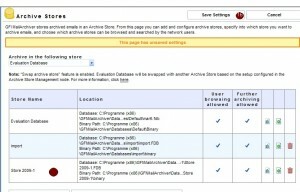 In the last form a summary of the archive store settings will be shown. Confirm the configuration settings (“Finish”) (15). However, if changes are required, then click the “Back” button and go to the form to amend the settings. 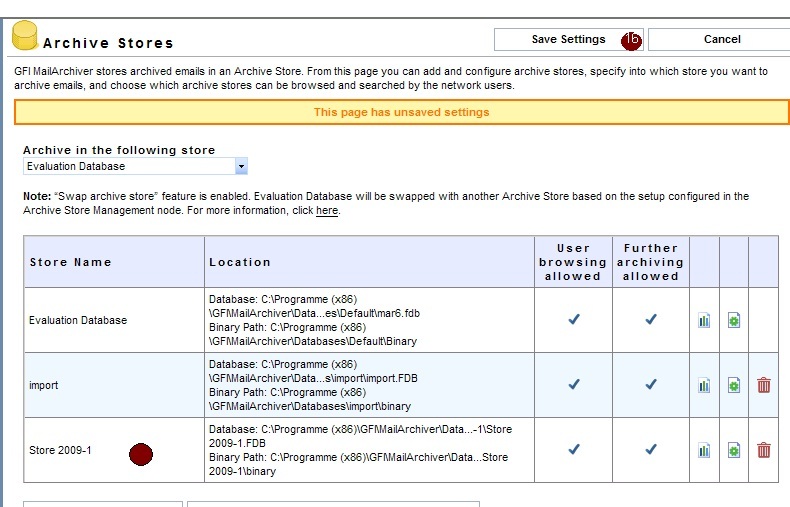 The new GFI MailArchiver Archive Store will now be displayed in the list. Save the page settings. . In the next post I will explain how emails except spam emails can be moved quickly from the old to the new GFI MailArchiver Archive Store.